In these lessons, we will learn how to find the angles and sides using the cosine ratio and how to solve word problems using the cosine ratio. If no diagram is given, draw one yourself. Mark the right angles in the diagram. Mark the angles or sides you have to calculate. Consider whether you need to create right triangles by drawing extra lines. For example, divide an isosceles triangle into two congruent right triangles. Decide whether you will need Pythagoras theorem, sine, cosine or tangent. Check that your answer is reasonable. The hypotenuse is the longest side in a right triangle. The following figure shows how to use SOHCAHTOA to decide whether to use sine, cosine or tangent in a given problem. Scroll down the page for examples and solutions. Use Pythagoras’ theorem to evaluate the length of PR. This video shows you how to find the missing length of a triangle using the cosine function. We are given a right triangle and two side lengths and a missing length. We show a right triangle and label the hypotenuse, and two legs the opposite side and adjacent side according to their relation to theta. 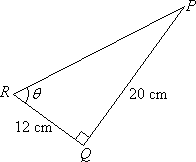 How to find the length of a side of a triangle using cosine? Trigonometry : using SOHCAHTOA to find missing angles. This video uses information about the length of the hypotenuse of a right triangle as well as a trig function to find the length of a missing side. A 60 ft ladder is leaning against a wall so that the top of the ladder makes a 15-degree angle with the wall. How high up the wall does the ladder reach? A ramp is pulled out of the back of truck. There is a 38 degrees angle between the ramp and the pavement.If the distance from the end of the ramp to to the back of the truck is 10 feet. How long is the ramp? 1. An airplane over the Pacific sights an atoll at a 20° angle of depression. If the plane is 435 m above water, how many kilometers is it from a point 435 m directly above the center of the atoll? 2. To find the height of a pole, a surveyor moves 70 feet away from the base of the pole and then, with a transit 2 feet tall, measures the angle of elevation to the top of the poleto be 30°. What is the height of the pole to the nearest foot? 3. A ladder 16 feet long makes an angle of 35° with the ground as it leans against a store. To the nearest hundredth, how far up the store does the ladder reach?